Set me as a seal upon your heart; for love is as strong as death. If you desire to have a Memorial Service for a departed loved one, you should notify the secretary at the cathedral office well ahead of time at 323-737-2424 (ext. 103), who will list your loved one in the Essentials for memorials that Sunday. Memorial Services are typically offered on the fortieth day after death, and also nearest the yearly anniversary following death. Our Memorial Services are held on Sunday at 9:45 AM, fifteen minutes prior to the start of Divine Liturgy. It is not mandatory that Memorial Services be held on the exact anniversary of death; though they should be held as close to the anniversary as possible…either before or after. Major Feast-days of the Lord, such as Christmas, Epiphany, Easter, Presentation of Christ, Transfiguration, etc. 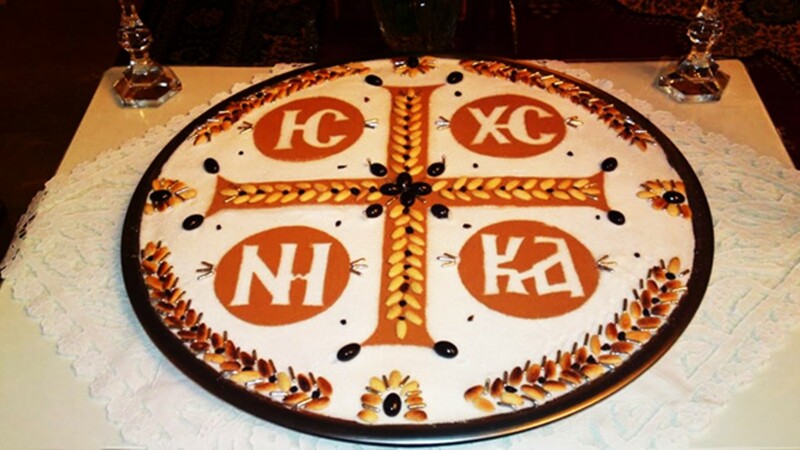 Kolyva (κόλλυβα) resembles a small pie made of boiled/dried wheat (also including different personal variations of raisins, craisins, pomegranate seeds, Jordan almonds, parsley, cinnamon, etc.). It is usually topped with a layer of powdered sugar and decorated with Jordan almonds. It is prepared for the service and then distributed to the community later during the parish coffee hour. This practice is based on the words of the Lord Jesus, using wheat to describe His own death and resurrection, “Amen, I say to you: unless a grain of wheat falls into the earth and dies, it remains a single grain of wheat. But if it dies, it brings forth a good harvest of many seeds” (John 12:24). Thus the kolyva is a symbol of our faith in the life-giving death and resurrection of Christ. Prayer for the dead is not seen by Orthodox Christians as an optional extra. Since the earliest of times, this ancient practice has been an essential component of our faith in Jesus Christ. Praying for those who have died is not merely an expression of mourning – it is also a proclamation that Christ has risen from the dead and that, in His love, even death cannot separate us from one another! In this service, we ask God to “grant rest” to the deceased “in the bosom of Abraham” (Luke 16:22-23) and to place him/her “in a place of light, a place of happiness, a place of refreshment, where there is no pain, no sorrow and no suffering” (Revelation 21:4) as we did during the funeral service. Everyone is also encouraged to remember their departed loved ones annually during the Saturdays of Souls associated with Great Lent and the celebration of Pentecost.